Eczema and psoriasis are common skin issues that can range from mildly annoying to debilitating depending on their severity. These disorders are characterized by itchy, scaly skin. While there are a number of treatment options, they often don't provide complete relief or they lose efficacy after a while. In particular, treating eczema can involve carefully avoiding substances that irritate the skin, using thick creams, and topical corticosteroids to help provide relief, and even taking antimicrobials, antihistamines, and immunosuppressives. As psoriasis is an autoimmune disease, doctors often prescribe immunosuppressive drugs to treat it as well. While searching for a more natural way to treat these conditions, researchers from the Department of Dermatology at the University of Varese in Italy identified a substance traditional Ayurvedic medicine uses for inflammatory diseases. It’s called boswellia gum resin extract. The boswellic acid found in this extract inhibits some inflammation pathways. As inflammation is a significant component of the discomfort both eczema and psoriasis cause, the researchers decided to investigate whether boswellic acid could help. They also tested another treatment sometimes used for psoriasis, bilberry seed oil, in order to see if it would be equally effective. For the study, the researchers divided 59 participants with either eczema or psoriasis into three groups. 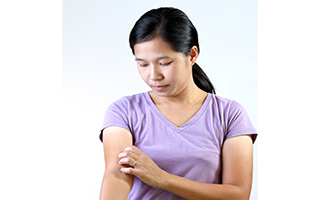 Half of each group suffered from psoriasis and half from eczema. The first group used a formulation of boswellic acid called Bosexil®. The second applied bilberry seed oil, and the third used a placebo. The participants applied the treatment or placebo in cream form twice a day for 30 days. The researchers evaluated the condition of the participants' skin before the trial began and after 30 days using the Psoriasis Area and Severity Index and the Eczema Area and Severity Index. For the psoriasis patients taking Bosexil and bilberry seed oil, scales improved in 70% and 80% of the patients, respectively, and redness improved in 60% and 10% of the patients, respectively. For those with eczema who took Bosexil, itching and redness improved for 60% of the patients. For those taking bilberry seed oil, itching improved in 67% of the patients and redness improved for 78%. For participants using the placebo, symptoms either remained unchanged or worsened for both the eczema and the psoriasis patients. Both Bosexil and bilberry seed oil contain fatty acids that have anti-inflammatory effects, which is likely why they were so beneficial to these patients. The study authors did point out that the study was both short and with a small group of participants, so the longer-term effects of these treatments have yet to be determined. However, they certainly seem to be promising. If you or a loved one is suffering from either eczema or psoriasis, boswellia or bilberry seed oil may help. Both are available for purchase online, with boswellia most commonly available in supplement capsule form.